The two finalists met for the third game in a row as it was another battle of university-sponsored teams. Abdullah Gul University had some momentum from the weekend game and used it early, overturning the deficit from Kayseri. The hosts were in poor shape heading into the final period, but surged to bring the aggregate back to even before taking the outright lead and winning 63-58, which was enough for a 136-127 overall win. Both teams also figure to be position to challenge for another trophy when the Turkish league continues. The Australian League kicks off this Friday, October 7th with the Perth Lynx taking on the Uni Flames from Sydney. The WNBL has continued to grow its fan base as basketball is not the most popular sport in Australia. Some would argue that it’s not even the second favorite sport in the country. However, the women’s league continues to attract great talent from the WNBA each year. Australia also produces some of the best women’s basketball players in the world. With the likes of recently retired guard Penny Taylor, the great Lauren Jackson and current Olympian Elizabeth Cambage, the Aussies have proven to the world that they can compete on all levels. 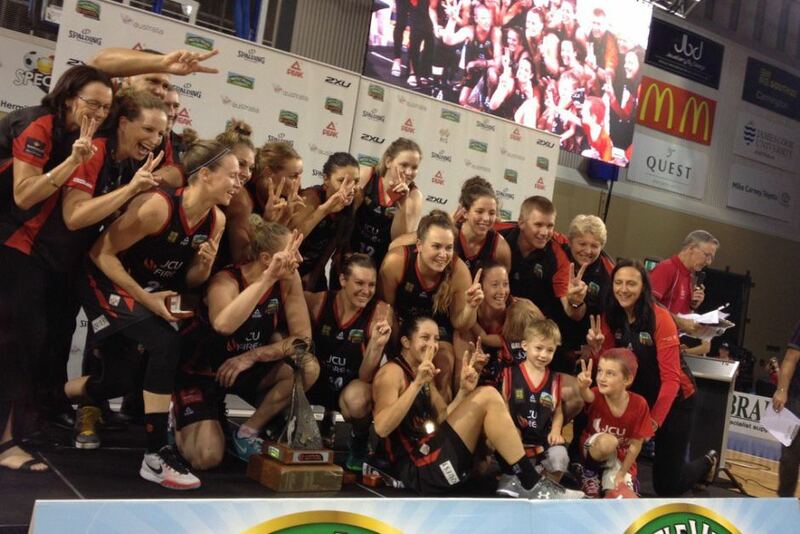 Last season, the Townsville Fire won the league championship, their second in a row. Anchored by Cayla George who had a stint in the WNBA with the Phoenix Mercury and Natalie Novosel who was drafted by the Washington Mystics in 2012. As more former and current WNBA players flock to the Outback to compete in the WNBL, this league will soon become one of the best in the world. Be sure to follow along as these 8 teams battle to become the newest WNBL champion. The 2016 Rio Olympics have officially began and women’s basketball started their preliminary games Saturday morning. Teams from Group A and Group B will battle it out to determine which eight teams will advance to the quarterfinals which begin August 16th. The preliminaries are grueling as teams have to play back to back games. There has been clear separation from the rest of the field by the United States as they have been completely dominant in their first two games. First defeating Senegal 121-56 and winning game two against Spain 103-63; a 52.5 point winning margin! Another team who surprisingly sits atop of their group is Japan who have won both of their games in convincing fashion. They started the tournament by defeating Belarus 77-73 followed by an impressive win against the Brazilian hosts 82-66. Australia, who is ranked second in the world by FIBA just behind the U.S. are also undefeated as they defeated both Brazil and Turkey so far. Canada have attracted some attention after winning against China and Serbia. France has also shown well as they too have not lost a game. 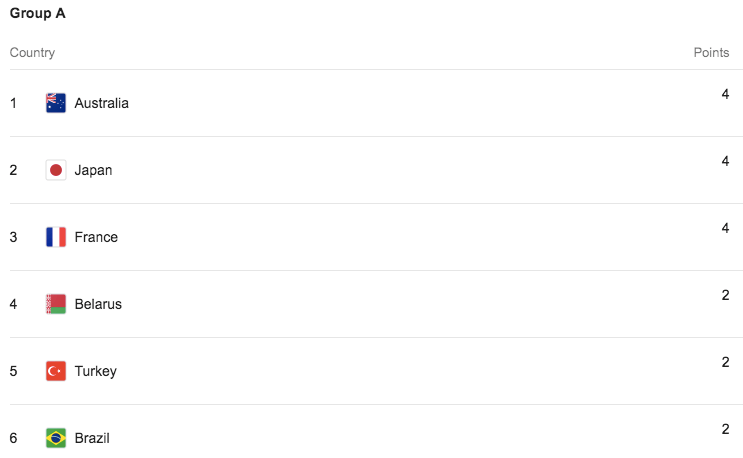 Most disappointing has been Belarus and Olympic host’s Brazil who both have yet to win a game. Belarus lost a heart-breaker on a last second basket against France. Brazil lost to both Australia and Japan by double figures. Serbia who fields a team with a few WNBA players still haven’t won a game as Canada handed them their second loss earlier today. China and Spain have both won a game a piece while Turkey and Senegal are in search of win number one. 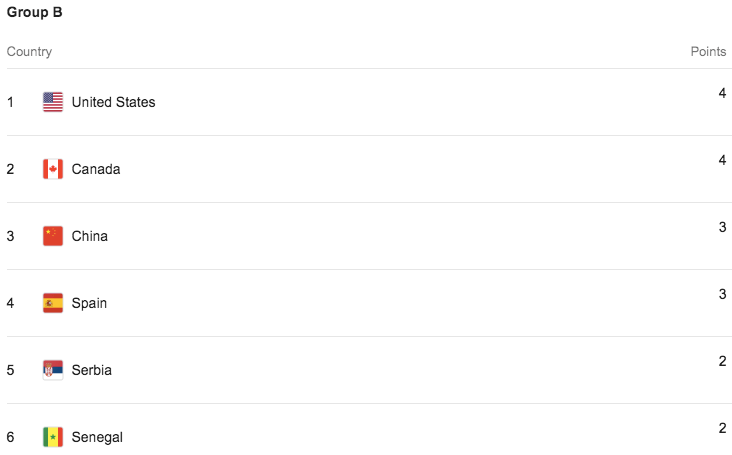 Below are the current standings after games played on 8/8. Games continue tomorrow as Australia takes on France, Brazil faces Belarus, and Turkey will battle Japan. The U.S. will be back in action on Wednesday as they take on Serbia at 1:30pm. The United States women’s national basketball team are the defending Olympic and world champions. The women have won a record seven Olympic gold medals and nine FIBA world championships. Starting from 1994, the U.S. women went almost 12 years without an international loss! It wasn’t until 2006, that the national team was defeated by Russia in the world championships and took home a disappointing bronze medal. At the last Summer Olympic Games in London in 2012, the U.S women won their 5th consecutive gold medal. They are now looking to win their 6th consecutive and 8th overall gold medal in Rio. The women are in Group B which includes China, Canada, Senegal, Serbia and Spain. They open up against Senegal on Sunday August 7th at 10am. 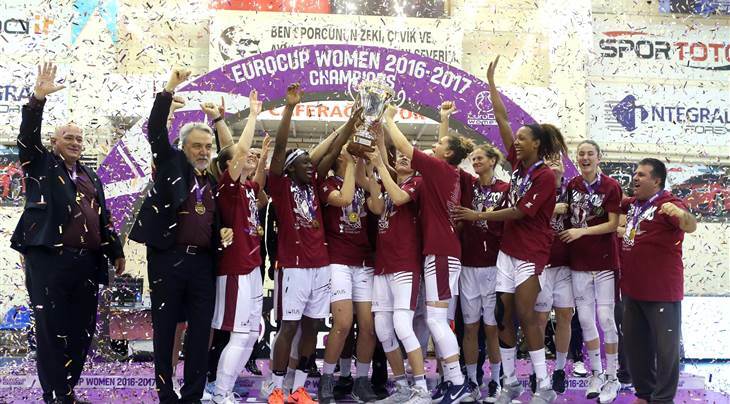 Over half of the WNBA’s players head to foreign countries after the conclusion of the season to join European and Asian clubs during their “offseason”. With the WNBA’s season lasting just over five months, players use their extra time to earn money overseas and to continue working on their basketball skills. One of the more established and popular countries that is a major destination for many players has been Turkey. Turkey has been popular for many reasons. For one, Turkey has one of the larger leagues in Europe. Last season the league fielded 14 teams with each team carrying up to two American players. Istanbul, Turkey’s largest city, is known to be one of the most popular travel destinations in the world. Istanbul is a modern and vibrant city with tons of nightclubs and a huge variety of restaurants, shopping centers and tourist activities. This makes Turkey a very attractive place for players to head where many people speak english and players feel welcomed and not too far from home. However, with the recent airport attack and the failed coup in Turkey many players are hesitant about heading back to the country they’ve grown to love. Should Women’s Basketball Lower The Rim? The WNBA’s 2015 league MVP Elena Delle Donne recently made a strong case for lowering the rim in women’s basketball. In an interview with New York Magazine that touched on the rampant sexism that female athletes face in today’s society, Delle Donne was quoted as saying “I just can’t wait for the day where people want to talk about your skills on the court and not your looks.” One of her ideas to thwart these misogynistic views of female athletes is to bring more attention to the sport. And a change that could potentially place more eyes on women’s basketball, and no it’s not tighter uniforms, but lower rims. The standard height of both men and women basketball goals are 10 feet. The only differences between men’s and women’s professional basketball are that women play with a smaller ball and shorter quarters. The men play 12 minute quarters, the women 10, and the women’s ball is about 1 inch smaller than the men. The average height of a WNBA player is around 6’0″ tall and the average height of an NBA player is 6’7”. However, men and women basketball players are playing on the same height rim. In volleyball, the proper height of the net for men is 8 feet tall and for women it’s 7 Feet 4 Inches. In golf, women generally don’t hit the ball as far as men. To make up for this power discrepancy, golf courses are usually designed with different tee boxes so that the difference in the distance women and men hit the golf ball is accounted for. So why isn’t there any difference in the height of the goal for men and women? Clearly, male basketball players are on average seven whole inches taller than their female counterparts so in turn are vertically closer to the rim which allows them to play the game “above the rim.” Although many praise the women’s game for its fundamentals and team play instead of focusing mainly on athleticism, it is clear that many fans want to see more women basketball players dunk the ball. The most common question I get after being asked how tall I am is “Can you dunk! ?” Everyone wants to know if you can dunk or not, as if that validates you as a basketball player. However, it’s what fans like to see. It brings more excitement to the game, it gives onlookers more to talk about and it would bring a new facet to the women’s game. There are a few players that currently play that can dunk the ball, however no one does it consistently. Don’t hold me to this, but I believe the only player to dunk in a game in the 2015 WNBA season was Brittney Griner. When you watch a men’s basketball game there is usually a dunk almost every other play and fans love it! They want to see players defy gravity. Fans want to see athletes do the impossible, do something that they most likely cannot do themselves and that is dunk the ball! Think about it, almost every time Griner dunks in a game it makes headline sports news. Other than that, the WNBA gets a ticker at the bottom of the screen with scores. I’m pretty sure the majority of women’s basketball fans would be against lowering the rim. They probably think the integrity of the game would be lost. But would it really? Would fans even notice that the rims were lower? I had no idea that volleyball nets were different heights for men and women. Did you? When you’re watching a volleyball match on television are you sitting there thinking “o that wasn’t that great of a spike because the net is lower!” I don’t think so. So if you were watching a WNBA game and Angel McCoughtry came down the middle of the lane and slam dunks I think you would jump out of your seat in excitement rather than sit back and frown and say, “well the rim isn’t at ten feet.” The women’s game is ever evolving, and you must not forget that professional sports is a business first. If a rule change could bring more excitement to the league which in turn should turn into more fans and more ticket sales and sponsorships, it’s something the the governing body should seriously consider. My only wish is that this could have happened when I was in my 20’s. At least that way I could have had a chance at a break-away dunk. At this point in my career, the only thing that could possibly get me to dunk the ball is a trampoline sitting at the bottom of the net. Let me know what you all think about lowering the rim. With the round moved to midweek, the national team had more time to prepare for their upcoming qualifiers. 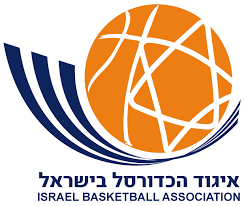 Maccabi Ashdod kept Elitzur Holon winless 72-63. The day’s strongest individual performance came from Lauren Mincy as she led Ramat Hasharon past Hapoel Rishon Le-Zion 88-81. Maccabi Ramat Hen stayed undefeated as they beat Hapoel Petah Tikva 79-65. 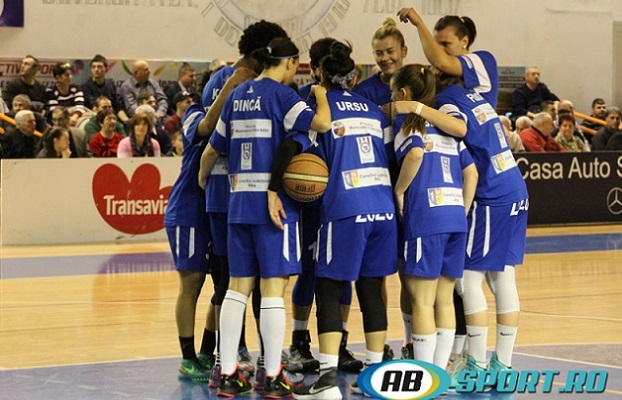 Wednesday started with a game between the two remaining winless teams as hosts Rapid Bucharest defeated Satu Mare 50-57. Arad used a balanced effort to beat Brasov 80-70. Shanita Arnold had the strongest individual performance of the round to lead Alexandria past Timisoara 72-58. Cluj beat Timisoara 87-79 despite a big scoring output from Donica Cosby. Sepsi remained undefeated by beating Galati 86-58. Winnus KDB started the season off 0-2 but were able to get their first win on the road against KB Stars. In what was a close game throughout KDB made some big shots at the end which sealed the deal. Pierson continues to lead the way for her team. Samsung who were also looking for their first win this week were on the road against KB stars. A close game throughout Samsung turned up the pressure in the fourth quarter and came away with the win. In a thriller on Tuesday night undefeated Woori Bank lost by 1 point to Hana Bank. With Houston out due to injury Bernice Mosby stepped up and had an amazing 28 points and 13 rebounds. Winnus KDB handed Shinhan Bank their first loss of the season. In control for most of the game and holding Shinhan to just 6 points in the second quarter KDB went into the half with a comfortable lead. 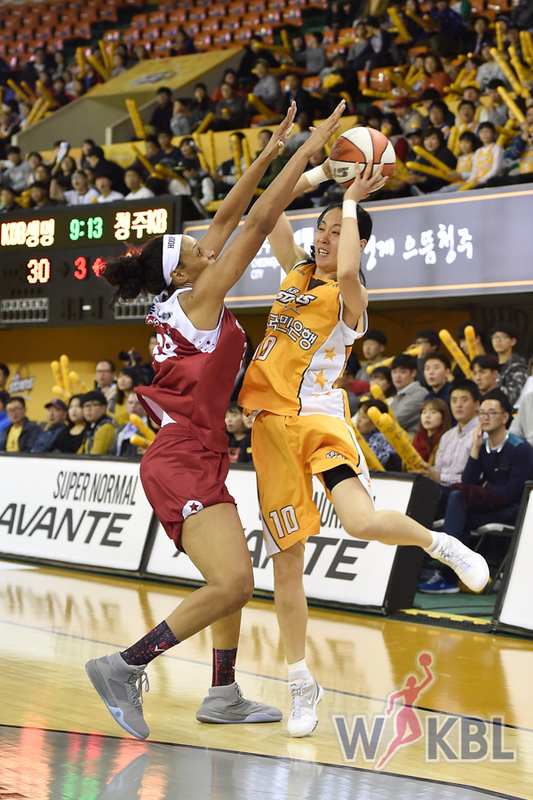 KDB won the third quarter by just six points as Shinhan began to claw their way back into the game. Shinhan outscored KDB 31-19 in the fourth but it wasn’t enough to come out with the win. KDB held Currie scoreless in the first half but she came alive in the second and finished the game with 29 points. Pierson continues to be a consistent force for KDB as she finished with 23 points and 8 rebounds.